Currently, student loans (whether private or federal) are not dischargeable in bankruptcy. However, with that being said, you can attempt to discharge them in bankruptcy if you can prove that the payments are an undue hardship. This can be incredibly difficult to prove though because you have to show that you are physically unable to work and you will not be able to make money (essentially for the rest of your life). This action is a separate motion that is filed with the bankruptcy court called an adversary case. Politicians are starting to realize that student loans are becoming a major problem and they are doing what they can to provide some assistance. On January 23, 2013 three senators reintroduced the “Fairness for Struggling Students Act of 2013” and the “Know Before You Owe Act of 2013” to try to help with the student loan epidemic (Orenbuch). The goal of these acts is to revise current bankruptcy rules to allow PRIVATE student loans to be discharged (Orenbuch). This particular bill has been introduced previously and failed to pass (Orenbuch). Federal student loans are the main issue facing borrowers today. 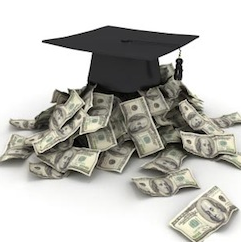 There are approximately $1 trillion in outstanding federal student loans in the United States currently (Orenbuch). These bills do not address federal loans, just private. However, there are numerous consumer groups that are currently pushing to make it easier to discharge federal student loans as well (Orenbuch). Many opponents believe that if these bills pass it will make it difficult for borrowers to obtain loans. They believe that lenders will impose higher interest rates, making it even more expensive to get an education. Supporters of the bills believe that it will in fact give incentive to private student loan lenders to make good loans. Knowing that they could potentially be discharged could potentially deter them from making risky loans (Cohen). Considering that the same bill has failed previously, it is hard to judge the likelihood of it passing this time around. But, it is definitely worth keeping an eye on if you are burdened by student loan debt, especially private loans. Orenbuch, Moshe, and Meredith Roscoe. “Student-Loan Bill Won’t Get an Easy Pass.” Barron’s. 6 March 2013. Cohen, Steve. “Allow Private Education Loan Debts to Be Erased in Bankruptcy.” US News & World Report. 6 March 2013.